Ethel Smyth’s opera The Wreckers has had a somewhat bumpy history from its very outset. It has claim to be her most satisfactory opera, I hesitate to use the word greatest, but is certainly not her most performed work. One of the few post-war performances of the work was a Proms performance in the 1994 conducted by Odaline de la Martinez which somehow failed to quite bring the work to life. That it can be brought to life, is something that I can confirm as in the early 1980’s I attended a performance of it at Warwick University (directed by Graham Vick with Anne Mason as Thirza). This transcended the limits imposed by the theatre and the young cast (a mixture of students and professionals) created a thrilling dramatic impact which has stayed with me. The Albert Hall performances on the other hand were rather staid by comparison. The Wreckers is a strange work because, though premiered in 1906, it contains little reference either to the work of Wagner or to Debussy. Smyth’s music is clearly of the Stanford/Parry/Brahms axis, not surprising given her age and the fact that she was trained in Leipzig. But structurally the opera seems to ignore many of the recent developments, at least in the first two acts. But in act three, when Mark and Thirza are tried by the wreckers and then marooned in the cave, things really take off; or they can do. I Fagiolini are bringing their performance of Striggio's Mass in 40 parts and Tallis's Spem in Alium to London. They will be performing them at a concert on 22 September at St. Augustine's Kilburn, being given jointly with the Renaissance Singers. I Fagiolini's CD of the pieces was fantastic so if you live in London its a good chance to hear them. I gather that their performances in such places as Cambridge and Bath have been a sell out. More info, and on-line tickets from the Renaissance Singers web-site. The Shard will be inaugurated as London's tallest building on Thursday 5 July. As part of the celebrations, at 10.15 pm there will be a spectacular laser and light show involving 12 lasers and 30 search-lights. At the same time the London Philharmonic Orchestra (who are resident at the nearby South Bank), will be performing Copland's Fanfare for the Common Man and the Finale from Stravinsky's Firebird. The laser display and orchestra performance will be streamed live on the the Shard's website and Facebook page. Sounds like quite a show. In addition to its 2012/13 season at Cadogan Hall, the Royal Philharmonic Orchestra is returning to the Royal Festival Hall for a season of 6 concerts which include a number of large scale choral works such as Britten's War Requiem, Durufle's Requiem and Berlioz's The Damnation of Faust. 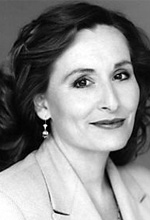 I was lucky enough, last week, to be able to catch up with Janis Kelly whilst she was in the middle of a busy rehearsal schedule for Richard Strauss’s Intermezzo, in which she plays Christine in Stephen Unwin’s new production which opens this year’s Buxton Festival on July 7, with Stephen Gadd as Robert, conducted by the festival’s new artistic director Stephen Barlow. In the middle of rehearsals, Kelly was finding the role of Christine tricky but rewarding; not for any technical reasons but because the role is so expansive, so huge. For Kelly, it feels as if Christine is ten times the size of role compared to the Marschallin, a role for which Kelly is well known. Intermezzo is a highly conversational opera, and Christine is in virtually every scene. That’s a lot of bars of music and every bar has its complexity; each is what she describes as a gourmet bar. Though the role is a challenge and difficult to get into the system, it is a challenge that she clearly relishes. On Saturday 7 July there is the opportunity to see a programme of dance inspired by some of the operas in the current Opera Holland Park season. At 1pm, English National Ballet (ENB) and Opera Holland Park (OHP) present a programme of five new works, performed to music for string quartet. James Streeter (a junior soloist with ENB) has choreographed a work for two men, inspired by Eugene Onegin, to a new score by Janine Forrester, a film composer and pianist who is one of the ENB music staff. A duet which attempts to capture the tensions the relationship between Lensky and Onegin. The Simon Bolivar Orchestra have dropped the youth from their name, their age range now goes up to around 30. But they are still the same ensemble, based on El Sistema. Their line-up is still very much like a youth orchestra, Egmont was performed with quadruple woodwind and substantial brass (eight horns and four trumpets), and then between the overture and the symphony there was a substantial change-over of woodwind and brass personnel. 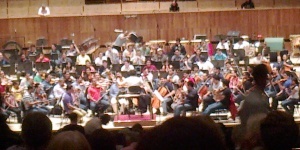 Clearly the orchestra was travelling with quite a large ensemble. Mozart's opera La Clemenza di Tito, his late masterpiece based on an opera seria libretto by Metastasio, is coming to the Isle of Dogs. A new company, Giornata Opera, will be performing the opera in Italian (with subtitles) at The Space, on the Isle of Dogs. Directed by Owen Lindsey, the modern dress production runs from 3 to 7 July. Good news last week for some arts organisations, 18 are set to share some £30.5 million in funding from the Arts Council, providing that they manage to match the amount with money from outside sources - some in a 1:1 ratio, others not. I'd be curious as to the rationale, and why some companies were more favoured than others - it looks as if the more money you get, the more you have to raise. The Halle have £1 million, which has to be matched 1:1, and it will be used towards their new Halle Centre in converted church in Ancoats, Manchester. Opera North gets £3 million, but they have to raise a whopping £6 million to get it; this goes to their fund which supports new productions like the critically acclaimed Ring Cycle currently in progress. A symphonic ode originally performed by four orchestras, one in each corner of Les Invalides. No, its not a newly discovered piece by Berlioz, but one by his teacher Le Sueur. Early 19th century France was full of out door, massed performances and religious services on a vast scale, they celebrated the idea that the people assembled represented the Nation. Nowadays Berlioz's Grande Messe des morts is rather regarded as a sign of the composer's distinctive, curious genius and perhaps his tendency to self-dramatisation, in fact its huge forces link it to these previous works by such composers as Mehul, Gossec, le Sueur and Cherubini. But nowadays getting the forces together for Berlioz's Requiem is quite a feat in itself, never mind finding a suitable location. And it was something of a coup for the City of London Festival to have two performances of the work conducted by Sir Colin Davis, the conductor most associated with the composer's work. The performances were of course in St. Paul's Cathedral and we attended the second one, on 26 June. The July issue of Opera Magazine includes the information that Carmen Giannattasio will be singing Maria Stuarda at Covent Garden in 2014; great to see that both Giannattasio and Donizetti will be back, but its a shame that we can't get major stagings of some of Donizetti's other serious operas. Also in 2014, there's a new Dialogues de Carmelites at the Theatre des Champs-Elysees in Paris, directed by Olivier Py with Rosalind Plowright as Madame de Croissy (the Old Prioress), the cast also includes Veronique Gens. Should certainly be worth crossing the channel for. I've seen some very fine Old Prioresses (including Regine Crespin), but will be very keen to see Plowright's histrionic talents in the gift of a role. And Susan Gritton will be doing her first Tatyana (Eugene Onegin) next year, at Grange Park Opera. Her Countess Madeleine (Capriccio) there was stunning, so I can't wait to hear her doing Tatyana. 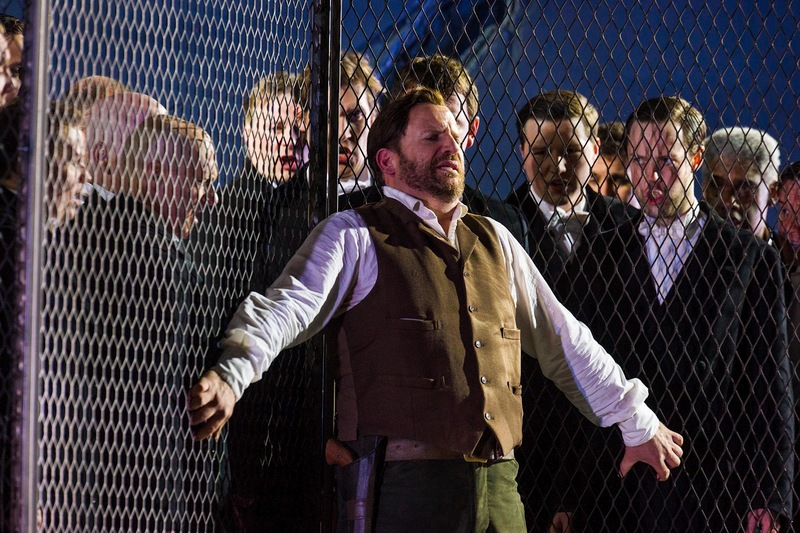 And even further ahead, Barrie Kosky (director of the recent Castor et Pollux at ENO) will be directing Handel's Saul at Glyndebourne in 2015, so it almost certainly won't be a traditional production. Whilst Saul is quite stageable, seems a shame that they can't do one of the operas. I recently I met up with soprano Kate Flowers, one of the co-founders of Co-Opera Co. to talk about the company and its forthcoming season at the John McIntosh Theatre in the London Oratory School. Kate Flowers's career was on the up, she'd made her Covent Garden debut and her London Coliseum debut, she was appearing at Garsington in Rossini's La Gazetta and was about to go to Nantes for Powder her Face. Then she had to go into hospital for a routine thyroid operation. It turned out not to be quite routine, but something good would come of it. Co-Opera Co. An opera company which helps opera singers get experience. Well, it has been quite a busy week. Last Monday I had a telephone interview with Janis Kelly to talk about her forthcoming role playing Christine in Intermezzo at Buxton (the article will be on the blog this coming Friday). Then on Tuesday were are at the British Museum to see the Royal Albert Museum and Art Gallery, Exeter, win the Art Fund Prize. Wednesday saw me travelling to Gatwick and back (the first time I've ever been to a gig on a train) for the press launch of the new Gatwick Express Tracks. Highly recommended if you have to travel down to Gatwick by train. Wednesday evening we were at St. John's Smith Square for the last Rosenblatt Recital there, given by Sylvia Schwartz. Thursday was Prince of the Pagodas at Covent Garden, a ballet that I have always rather loved and it was nice to see it back in the Royal Ballet repertoire. Friday morning I had a long talk with Kate Flowers from Co-Opera Co. about their summer season (the article will be on the blog tomorrow). And then on Saturday I spent the best part of the day at the Southbank, seeing the Simon Bolivar Orchestra and Southwark Children's Orchestra and meeting people from In Harmony Lambeth (the first part of the post appeared this morning, the rest will be on Wednesday). Then Saturday evening we caught up with the new production of Billy Budd at the London Coliseum. On Saturday 23 June Jude Kelly opened four days of music making at the Southbank Centre, centred on young people. The idea was to reproduce the Venezualan nucleo, a coming together of young people for music making all day. The four days were centred on the residency of the Simon Bolivar Orchestra who would be giving two concerts under conductor Gustavo Dudamel, all of them products of the famous Venezualan El Sistema. Saturday started off with a concert in the Clore Ballroom from the Stockwell Childrens Orchestra, the combined orchestras of In Harmony Lambeth. In Harmony Lambeth is one of three pilot projects of In Harmony - Sistema England, a social and music education programme that was established in 2009 by cellist Julian Lloyd Webber as the English incarnation of El Sistema. The three current projects are in Lambeth, Liverpool (Everton) and Norwich. All are designed to give disadvantaged children the opportunity to make music, on the firm basis that the cooperative musical experience can have other beneficial social effects. Stephen Crowe's opera, The Francis Bacon Opera, fascinatingly takes the text of Melvyn Bragg's amazing 1986 interview with Francis Bacon and sets it word for word as an opera. Frank and inflammatory with music by a composer who himself studied as a painter. Excerpts from the opera, with Christopher Killerby (tenor) and Genevieve Ellis (piano) are being performed on Thursday 28 June during the Cortauld Gallery's late opening for their current exhibition Mategna to Matisse: Master Drawings. 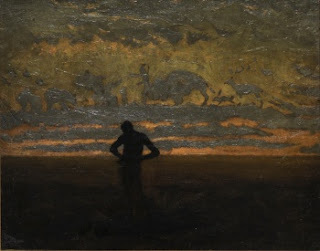 So you get to hear Crowe's setting of Bacon's views on his own work, Ingres, van Gogh and Monet, alongside the real thing. 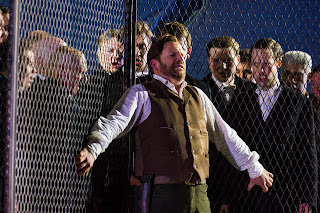 ENO last did Billy Budd in 2005, in a dramatic but unlovely production by Neil Armfeld which was borrowed from WNO; this had replaced Tim Albery's notable production. Showing either that the company is keen to do well by Britten's harrowing opera, or that they are being a little profligate with productions. This latest outing, directed by David Alden, conformed to Alden's rigorously stylised aesthetic. Designed by Paul Steinberg with costumes by Constance Hoffman, it seemed to be set on a mid-20th century vessel, probably an Eastern Bloc one, the whole atmosphere was one of control and repression. The officers all wore leather coats, to a rather startling Nazi effect, and control was effected via a group of military police with batons. We never saw the sea, the nearest we got was the smoke and mist drifting around at the opening to act 2, all the action took place in a firmly industrial looking environment. By contrast, the Captain's cabin was pure white, perhaps it was meant to be futuristic, but the result rather looked like a 70's shoe shop emptied of shoes. As if to emphasise the struggle between good and evil which the opera embodies, Captain Vere (Kim Begley) was all in white and Claggart (Matthew Rose) always appeared from underground, via a hole in the stage. I Fagiolini are back again with another wowjer of a recording. Having released a CD of Striggio's mega-multi-part mass last year, they have now recorded a reconstruction of Giovanni Gabrieli's Magnificat a 20 a 28 for seven four-part choirs. They have presented the magnificant in the context of vespers, a highly informed, but speculative reconstruction of vespers for the Feast of Our Lady of the Most Holy Rosary in commemoration of the Battle of Lepanto. In 1571 the Holy League of Spanish, Roman and Venetian forces achieved a famous victory over the Ottoman navy at the Battle of Lepanto. The victory was attributed to the intercession of the Virgin. So the celebrations subsequently took place on the newly instituted feast of the Rosary. Except in Venice, which attributed the victory to both the Virgin and St. Justine of Padua. The battle was celebrated in many Venetian poems, paintings and musical settings, including probably Gabrieli's seven-choir magnificat. 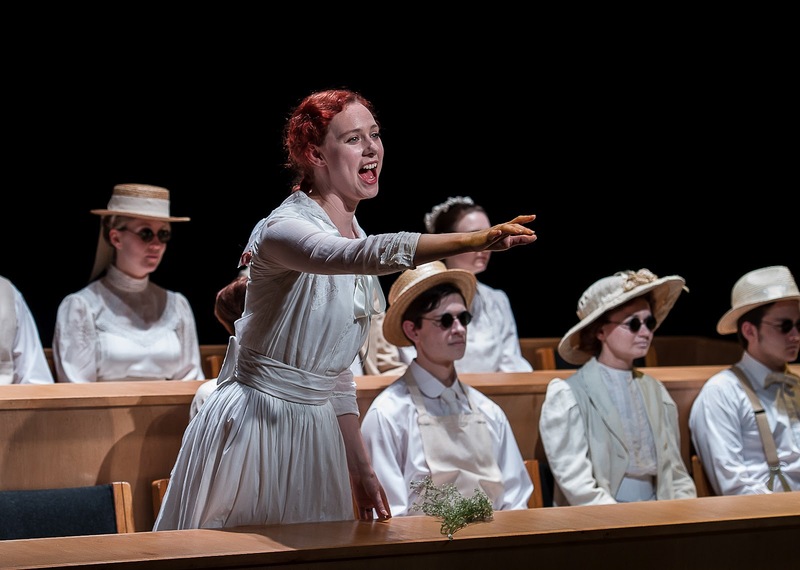 Not only are the Buxton Festival giving us the UK premiere of Sibelius's opera The Maiden in the Tower (in a double bill with Rimsky Korsakov's Kashchei the Immortal opening on 9 July). But the Saccini Quartet will be giving the UK premiered of Sibelius's Moderato - Allegro in C# minor at their festival concert on 16 July (in a programme with Ireland's first string quartet and Brahms's Clarinet Quintet with Andrew Marriner). The Sibelius is an early work, dating from 1888-89, before the sequence of symphonies started. 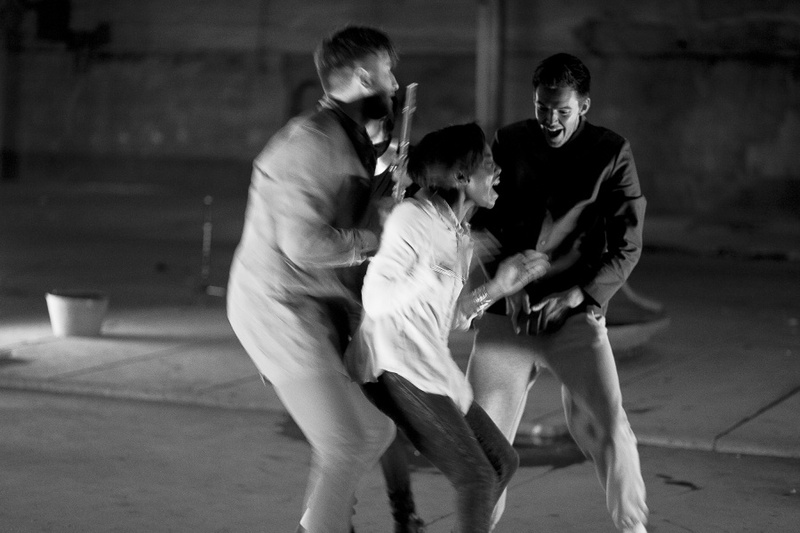 The one-movement quartet is a stormy, intense movement. Should be interesting. Its something of a miracle that Kenneth Macmillan's choreography for The Prince of the Pagodas exists at all. The choreographer was interested in working on Britten's score, but the composer refused to help by making changes to the score. So, eventually Macmillan went ahead anyway, working with Colin Thubron to create a scenario that fitted the existing music. The basic problem is that John Cranko's original idea for the ballet, to re-create the world of the late 19th century Russian fairy-tale ballets, had ended up with far to much divertissement-like padding and rendered his final ballet unsatisfactory. Macmillan's version was highly successful, and made a star of the young Darcy Bussell on whom the role of Princess Rose was created. But there was always the underlying feeling that there were moments when dance had been fitted to music, because it was there, and the drama still sagged. For this revival Monica Mason and Grant Coyle have persuaded the Britten estate to let them cut the piece. This means that, for the first time, the drama doesn't sag, the piece runs at a dramatic tempo throughout. This doesn't solve the problem that there is a slight mismatch at times between the relative emotional temperatures of music and dance, and that there are stray elements of Britten's musical narrative and leit-motifs which do not seem to march with Thubron and Macmillan's story-line. But these are relatively small points, Macmillan and his collaborators have created a potent dramatic ballet from one of Britten's most fascinating scores, his longest single orchestral score. We attended the performance on Thursday 21 June when the cast was supposed to be Lauren Cuthbertson, Zenaida Yanowsky and Rupert Pennefather. In the event all three were injured (as was Ricardo Cervera who was due to play the King of the South). So we had Beatriz Stix-Brunell, Itziar Mendizabal and Ryoichi Hirano in the lead roles. To celebrate Judith Bingham's 60th birthday (which, incidentally is today), JAM have commissioned a piece from her which is being premiered by the Orchestra of the Age of Enlightenment at the City of London Festival. It promises to be a fascinating combination of old and new. The new piece, The Hythe, is inspired by Bingham's visits to the coastal town of Hythe and in fact the new piece is going to be played there. Bingham's theme for the piece is a sailor coming home from the sea, a way of linking the piece to the two places (London and Hythe) where the piece will be performed. (Incidentally, Bingham discovered that the word hythe is an old word for haven). 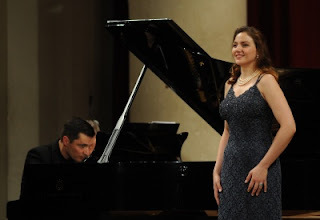 Soprano Sylvia Schwartz appeared last night (20 June) at the fine recital in the current Rosenblatt Recitals season at St. Johns Smith Square. In fact, this was to be the series' last recital at St. Johns because from next season they are moving to the Wigmore Hall. Schwartz, accompanied by Simon Lepper, gave a very traditionally structured recital which ultimately charmed and delighted. She opened with a pair of arie antiche; Paisiello's Nel cor piu no mi sento from L'amor contrasto, an aria on which various composers including Pagannini did variations, and Se tu m'ami which is attributed to Pergolesi but is almost certainly by the 19th century editor Alessandro Parisotti. The aria was one of those which Stravinsky re-used in Pulcinella. Yesterday I was one of a group of journalists who travelled to and from Gatwick on the Gatwick Express for the launch of Express Tracks. 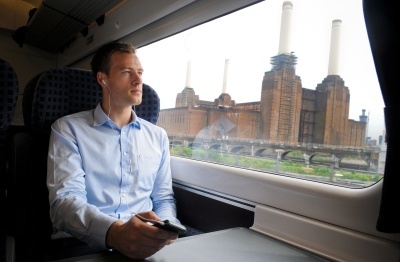 This is a new project to provide travellers on the Gatwick Express with music designed to go with the journey, timed to the 30 minutes. Customers who buy tickets from their website can download the music to play on their personal devices. The composer Philip Sheppard has written a score and then Benga, the producer and Radio 1 DJ, and the UK band The Milk have reworked Sheppard's score in their own style, thus creating three very different but interwoven scores. In fact, the listener can flip between them and keep the sense of the developing journey. To the British Museum's Egyptian Galleries last night for the 2012 Art Fund Prize for museums and galleries. The event marked the 10th anniversary of the prize and the 5th anniversary of the Art Fund sponsoring it, the prize is organise by the Museum Prize Trust whose chair is Penelope, Viscountess Cobham. Last year's winner was the British Museum. Speakers included Stephen Deuchar (Director of the Art Fund), Jeremy Hunt (Culture Secretary and member of the Art Fund), Lucy Worsley (member of the judging panel), Chris Smith (chairman of the judging panel) and Penelope Cobham who paid tribute to all 10 winners of the prize. Stephen Deuchar commented on the remarkable range of projects this year, despite the combination of central government cuts and reductions in local authority spending. Jeremy Hunt pointed out that visits to museums and galleries make up a quarter of the spend of all foreign visitors (and that a quarter of all foreign visitors visit the British Museum); both staggering statistics. The great classics of Western Classical sacred music were written for performance within the liturgy and, no matter how sensitive a concert performance is, it remains a concert performance. There is something profoundly satisfying about hearing a Palestrina mass performed within the context of the correct religious service. Now, I have to admit that I am something of a plainchant nut so that I can easily sit through hours of the stuff and find a fully sung Tridentine Mass a profoundly satisfying musical experience. Not everyone does, of course. And in my own programmes I have to take care to limit the amount of chant. And fully sung Latin masses are very much a Roman Catholic tradition, in the Anglican church a different musical tradition has developed which mixes the sung elements with a largely spoken service. The Edington Festival offers an ideal view of this, music from 1000 years of Western classical tradition performed by three superb choirs in the context of the Anglican liturgy. The Priory Church at Edington is a glorious medieval church and the services themselves are richly evocative. You also usual get some damn good preaching. This year the three choirs are directed by Benjamin Nichols (all male Schola Cantorum), Matthew Martin (Nave choir of men and boys) and Jeremy Summerly (mixed voice consort). The festival programme, put together by festival director Ashley Grote, celebrates the church's year and runs from 19 - 26 August. Covent Garden are going to be performing Meyerbeer's Robert le Diable next season (and booking has already opened for Friends of Covent Garden), so it seemed a good time to take a sideways look at women French grand opera. In fact the early 19th century in France wasn’t a particularly good time to be an operatic heroine, the roles available seem to have been confined to two, the virgin and the tart. There are of course variants on these, virgins can be led astray usually by being deceived and tarts can have hearts. But, of course, if a virgin is led astray then the result almost certainly had to lead to tragedy and similarly for tarts with hearts. Whilst this is generally true of a lot of 19th century opera, it is particularly true of 19th century French opera where complex roles for women were limited and strong roles barely existed. This seems to have become codified in the early part of the century when grand opera based on classical myth gradually made way for the French Grand Opera of the type written by Auber, Meyerbeer and Halevy. Halevy’s La Juive has just two major female roles, Princess Eudoxie is the coloratura soprano, she is worldly, flirty and not particularly germane to the plot, whereas Rachel is virginal, led astray, pure but misguided in her love and ultimately sacrifices herself. These roles would almost become standard types; the first Rachel, Cornelie Falcon, whose soprano voice had a dark mezzo-soprano quality, would become known for her playing of such soiled virgins such as Rachel or Valentine in Meyerbeer’s Les Huguenots. A rare performance of the once popular Song of Hiawatha trilogy by Samuel Coleridge-Taylor will be given by the Cumbria Choral Initiative with the Northern Chamber Orchestra conducted by Ian Jones, with soloists Lesley Jane Rogers, Nicholas Hurndall Smith and Nigel Dempster. The performance takes place on 28 July at the Coronation Hall, Ulverston. Hiawatha's Wedding Feast was premiered to great acclaim at the Royal College of Music in 1898. Over the next two years Coleridge-Taylor complete The Death of Minnehaha and Hiawatha's Departure and the trilogy was first performed in 1900 at the Albert Hall. The popularity of Hiawatha's Wedding Feast rather outstripped the other two parts and it continued to be regarded as a work in its own right. The trilogy was presented annually at the Albert Hall from the 1920's to the Second War, complete with scenery. Marking the 50th anniversary of John Ireland's death, the festival John Ireland in Chelsea runs from 21 to 25 June in the two Chelsea churches where Ireland was organist and choirmaster - St. Lukes and Holy Trinity. Kitty Whately and Andrew Staples will be giving a recital with pianist William Vann performing two major Ireland song cycles alongside music by his pupils Alan Bush, Geoffrey Bush and Richard Arnell. Roderick Williams gives a recital which includes Ireland's songs and choral songs (performed by the Addison Singers) alongside those of the two Bushes and Ireland's teacher, Stanford. Also included in this programme is Ireland's melodrama Annabel Lee with speaker Timothy West. The festival finished with three of Ireland's major chamber works, performed by Julian Lloyd Webber, Rupert Marshall-Luck, Jiaxin Chemg and John Lenahan. The BBC Philharmonic Orchestra will be the main guest at the Luosto Classic Festival in Finland in August, the orchestra's first visit to Finland. Conducted by John Storgards, their open-air concert will perform the Finnish premier of Kalevi Aho's percussion concerto Sieidi, with percussionist Colin Currie. It is a joint concert with the Lapland Chamber Orchestra and also on the programme is Aho's Luosto Symphony. Sieidi was premiered in April in London with Colin Currie and the London Philharmonic Orchestra conducted by Osmo Vanska. The title, Sieidi, is a Lappish word for holy sacrificial rock). In May, Aho's Concerto for Trombone and Orchestra was given its UK premiere with Jorgen van Rijen and the BBC Symphony Orchestra conducted by Alexander Vedernikov; a work described as absurdly demanding and calling on the soloist to sing whilst playing. So far, Aho has written 19 solo concertos, including recent ones for trumpet and chamber orchestra, trumpet and symphonic wind orchestra. In October 2012 he has a new concerto for theremin being premiered. Other interesting timbres include the concerto for saxophone quartet and orchestra. So we have a new clutch of birthday honours, with some interesting selections from the arts. Zaha Hadid becomes a dame, Kenneth Branagh, Michael Body, Gareth Malone and David McVicar all become knights. Michael Berkely and Harry Christophers get CBE's, Edward Gardner, Tasmin Little and Joanna Macgregor get CBE's. Congratulations to all. English Touring Opera have confirmed the dates for their autumn tour with its contemporary theme. Albert Herring opens at the Linbury Studio on 4 October (futher performances on 6, 10 October), The Emperor of Atlantis opens at the Linbury on 5 October (further performance on 12 October), with The Lighthouse on 11 and 13 October. The tour then goes to Cambridge (16-19 October), Exeter (24-27 October), Tunbridge Wells (29, 30 October), Harrogate (1-3 November), Bath (5,6 November), Snape Maltings (9-11 November) and Buxton (16, 17 November). Further details from the ETO website. Ullmann's The Emperor of Atlantis will be paired with the Bach cantata Christ lag in Todesbanden which will be performed in an orchestration by Iain Farrington that uses the same instruments as the Ullmann. ETO have also commissioned a 10 minute song cycle, Towards and Unknown Port by Helen Chadwick as a response to the Ullmann. The song cycle will be performed as an optional extra before The Emperor of Atlantis. The operas for their Spring 2013 tour have also been announced and its a pretty powerful trio. Mozart's Cosi fan Tutte , Verdi's Simon Boccanegra and Donizetti's L'Assiedo di Calais. The cast for the Mozart will include a fabulous trio of women Laura Mitchell, Kitty Whately and Paula Sides. Simon Boccanegra will be in receipt of a grant from the Peter Moores Foundation, enabling ETO to field a bigger than usual chorus and orchestra. Cast will include Keel Watson as Fiesco; Watson made a strong impression in the recent Opera Holland Park Lucia di Lammermoor. The tour starts in March at the Hackney Empire. We can't wait! Violinist Christina Astrand and pianist Per Salo have played together for several years and both play for the Danish Radio Symphony Orchestra. Astrand is the orchestra's Principal Concert Master and Salo holds the position of pianist, organist and harpsichordist with the orchestra. The duo have recorded CD's of Danish music and this disc is their first of non-Danish repertoire. They have chosen three works for violin and piano, all dating from the first quarter of the 20th century. Ravel's Violin Sonata dates from 1923-27 and Bloch's Poeme Mystique from 1924; Janaceck's Violin Sonata was started in 1915 but was not finished in its present form till 1922. I was at the Village Underground in Shoreditch last night for the Opera Group's performance of Harrison Birtwistle's Bow Down, being given as part of Spitalfieds Summer Festival. The festival is about half way through (it runs until 23 June), but there are still plenty of rather interesting events. Paul McCreesh and his Gabrieli Consort and Players will be comparing and constrasting Stravinsky's Mass with early polyphony by Josquin and Willaert, plus some James MacMillan on Thursday 14th at Christ Church, Spitalfields, which still remains the festival's best location. June 14 and 15 sees La Nuova Musica pairing Carissimi's Jephthe and Charpentier's Sacrificium Abrahae. June 15 and 16 has the Sixteen performing new music by Alec Roth to accompany monologues by Samuel Beckett with Alan Howard - a potent and curious combination. Monday 18 June has the Monteverdi Choir performing unaccompanied for a change, with John Eliot Gardiner performing an all British programme - Tallis, White, Tomkins and Byrd. Cellist Matthew Barley is the soloist in a performance of John Tavener's The Protecting Veil on 20 June. The festival finale on 23 June combines 200 voices, brass, pyrotechnics in a meditation on fire - the premiere of a new piece by David Bruce. Performers include a specially assembled choir (in fact I might have been singing myself if I hadn't been otherwise engage), plus the Opera Group, the Gabrieli Consort (who are giving the final formal concert of the festival earlier that evneing), Horns Aloud and The World Famous fire artists. 9pm and its free. Bow Down isn't exactly an opera, by any stretch of the imagination. 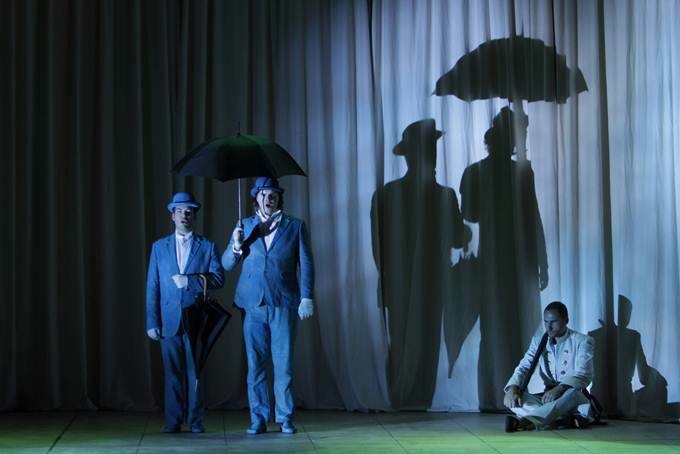 But it is a music theatre piece by Harrison Birtwistle and Tony Harrison and as such a new production of it directed by Frederic Wake-Walker is being toured by the Opera Group. The production opened at the Brighton Festival and I caught up with it at the Spitalfields Summer Festival where two performances were given on 13 June, at Village Underground. The venue is a converted warehouse in Shoreditch now used as a performance space and linked to artists studios on the same site, notable for the fact that the studios include a pair of old tube-trains which are perched on top of the building. Bow Down was created in 1977 when Harrison Birtwistle was working at the National Theatre during a strike, so that Birtwistle and Harrison created a piece which was simple to stage and required very few resources. It is a devised piece, and the existing score is simply a notation of what was created at that time; performers have a lot of freedom in deciding how and what to perform. The simplicity of staging has meant that for his new production Wake-Walker was able to put together a tour which encompassed some very varied spaces, not only the converted warehouse, but an abandoned municipal market in Brighton, a secret forest location in Norfolk and an open air stage. My review of The Pleasing Slumber a disc of John Jenkins music from French group is on MusicWeb International. A lovely disc. 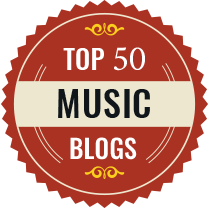 Relax and listen to some finely intelligent music-making. The Salomon Orchestra, under conductor Neil Ferris, will be giving an all English programme for their final concert of the season at St. John's Smith Square on 26 June. They start with Ireland's London Overture and finish with Elgar's Enigma Variations. In the middle Edward Vanderspar will be the soloist in Walton's Viola Concerto. Vanderspar is joint principal violist of the London Symphony Orchestra, so its nice to see him getting out in front of the orchestra. More information from the Salomon Orchestra website. Edward Rushton's opera Babur in London, which received its UK premiere last night (12 June) at the Haymarket Theatre in Basingstoke, is the result of an interesting collaboration. The librettist is the Indian poet, novelist and musician Jeet Thayil (who lives in Dehli) and his collaboration with Rushton (who lives in Switzerland) was supported by the British Council and Pro Helvetia (the Swiss Arts Council in India). The Opera Group co-produced the work with Anvil Arts, Basingstoke and Opera North and it will be seen in India. Babur in London premiered in Switzerland and tours to Leeds (14, 15 June), Birmingham (18 June), Oxford (24 June), London (26, 27, 28 June at the Lilian Baylis Studio as part of the City of London Festival), Hull (5 July) and Cheltenham (7 July, as part of the Cheltenham Music Festival). The production will be touring to India in November/December this year. St. Andrews Voices is a music festival based in St. Andrews, which makes its debut in October this year (18 to 21 October). They have put together quite a programme, headlined by Ian Bostridge, patron of the festival, who will be performing Schubert's Winterreise with Julius Drake at the piano. Baritone Ben McAteer (who appeared recently in the Guildhall School production of Ned Rorem's Our Town) will be accompanied by pianist Gavin Roberts in a programme of arias by Tchaikovsky and Korngold and songs by Schumann and Vaughan Williams. Another baritone, Damian Thantrey (who is currently appearing in the Opera Group's production of Edward Rushton's Babur in London, and who sang the title role in my first opera, Garrett, in 2001) will be performing with Cabaret Chordelia in an evening of song and dance inspired by 1930's Berlin cabaret - quite a change from contemporary opera! A mass grave, containing 51 decapitated Viking skeletons, was found when the Weymouth relief road was constructed in advance of the Olympic sailing events. The road building was delayed, but the event inspired Stephen McNeff's opera-oratorio The Chalk Legend. The work was commissioned by Bournemouth Symphony Orchestra as their London 2012 event. It has received four performances already in Dorset and now the work is receiving its London premiere on July 14th at The Forum, Kentish Town, NW5. London Concert Choir will be joined by Twyford C of E High School Chamber Choir, Heath Mount School Choir, Kokoro, Dorset Youth Orchestra, Ealing Youth Orchestra, actors from Drama Centre London and soloists Erica Eloff (soprano) and Toby Stafford-Allen (baritone). All conducted by Mark Forkgen. Sounds quite an event! Stephen McNeff is the Bournemouth Symphony Orchestra's former composer in residence and for Chalk Legends he wrote a series of works, starting at village hall level and finishing with a huge performance of the full work in May 2012, a huge Dorset community-based music and dance based project. McNeff's other music theatre works include Clockwork, an opera based on a book by Philip Pullman, The Gentle Giant, based on a book by Michael Morpurgo, and Tarka the Otter. This latter, which was premiered in 2007, was performed at the 2011 Buxton Festival. More information from the Chalk Legends website. Barts Choir are performing at the South Bank Centre tomorrow night (13 June) under their conductor Ivor Setterfield, in a programme of Coronation themed anthems by Parry, Handel and Walton. The evening is in aid of the http://www.rainbowtrust.org.uk/ . Fiona Bennett trained at the Royal Welsh College of Music and Drama and the Guildhall School of Music and Drama, going on to become a regular performer of her own material. She spent many years as a singer, pianist, song writer and band leader before putting her career on hold to devote herself to her family. She has now recorded an album of her own material, playing keyboards and singing on the final track. The first six tracks on this disc, form A Country Suite, a suite inspired by Bennett's love of costume dramas from the 19th century, each a snap shot of country life in that era. The movements' titles suggest a hidden story, The Landscape, A Country Gathering, The Harvest, A Lad and A Lass, Up River and Winter draws in. Bennett's style is lyrical and free flowing with surprisingly rich textures. Her lilting style seems to be rather folk influenced, with a highly developed melodic gift. The movements all sound like song transcriptions, Bennett's highly melodic lines almost cry out to be sung. When you listen to the suite you feel as if there are words, just behind each movement, each a song without words. Linn Records is going to start offering the back catalogue of Universal Music through its digital download site. The recordings will be offered as in high-quality digital format. Now, for people that don't like mp3 quality but want a down-load then this is great news. You can get downloads in a sound quality superior to CD. But it also represents another step. Universal Music own Decca and Deutsche Gramophon, whose back catalogues are truly legendary. Not all the recordings have made it to CD and even then when they do CD's come and go alarmingly. If you don't buy a re-issue when you see it, then you are going to be feeling rather annoyed with yourself. The sixth Tête à Tête: The Opera Festival is taking place between 2 and 19 August 2012. If you want to find out about the future of opera and see what people are trying out and experimenting with, then you need to be at the Riverside Studios in August. There will be over 30 performances by 30 companies, all new work. Tête à Tête themselves are developing two new commissions, an adaptation of Elizabeth Bowen's Making Arrangements with music by Charlotte Bray. And Samuel Bordoli's adaptation of Kafka's Amerika. There will be visting companies galore and the chance to see work in progress, sketches of work to be and fully formed operas. Of course the 2010 festival was notable, amongst other things, for the concert performance of my opera When a Man Knows! But the 2012 will be the place to test the waters of opera of tomorrow. Co-opera are returning to the John McIntosh Theatre of the London Oratory school for their summer season in 2012. The company, founded by soprano Kate Flowers and lighting designer Paul Need, is aimed at that difficult area, young singers starting out in the profession. The company aims to help them by providing help, training, experience and paid performances. The company is entirely self-funded and run by a group of 50 opera professionals. This summer they are performing Don Giovanni (directed by William Relton, conducted by Tim Murray) and Hansel and Gretel (directed by James Bonas, conducted by Stephen Higgins) in a season running from 22 August to 25 August. Then in the Autumn they will be touring these two along with their production of The Magic Flute. Further details from the Co-opera website. My review of the Venice Baroque Orchestra's pasticcio version of Metastasio's L'Olympiade, with music by 16 composers from Caldara to Cherubini, is on the Opera Today website. I'm off to Basingstoke on Tuesday for the UK premiere of Edward Rushton's Babur in London being given by the Opera Group. The cast includes Damian Thantrey who was Garrett in my first opera and the piece is directed by John Fulljames with the ensemble für neue musik zürich. As a lover of all things G&S of course, Basingstoke is forever associated with Mad Margaret but we look forward to rather different fare on Tuesday! I've posted a couple of synthesized versions of recent pieces to SoundCloud. Duino Angel is a concertino for bassoon (or cor anglais) and string orchestra based on my setting of Rilke's Second Duino Elegy. And Orpheus's Journey is a tone poem for large orchestra inspired by the opening stanzas of Rilke's Orpheus, Euridice, Hermes. Fiona Bennett trained at the Royal Welsh College of Music and Drama, going on to become a regular performer of her own material. She spent many years as a singer, pianist, song writer and band leader before putting her career on hold to devote herself to her family. She has now recorded an album of her own material, playing keyboards and singing on the final track. The weather seemed to match the opera's dark subject matter for the opening night (7 June) of Opera Holland Park's new season. The opera chosen was Donizetti's Lucia di Lammermoor in a production directed by Olivia Fuchs and designed by Jamie Vartan, conducted by Stuart Stratford. With Lucia di Lammermoor a director has to decide quite how straight to play things. Whether the story will be told in a plain manner, with the audience asked to supply all the interesting psychological insights, or whether the story will be taken for granted, overlayed with psychological subject matter. Fuchs and Vartan opted for a middle way, which gave the audience a clear telling of the story but made the psycho-sexual nature of the plot quite clear. Another decision to be made, this time particular to Opera Holland Park, is how much of the house to use in the set. Vartan had designed a huge stone slab which, at the opening, obscured much of the facade. This slab, resembling slate or, more aptly, granite, moved and split apart to reveal elements of the facade. Only in the wedding scene did the slab split apart far enough to reveal the portico of the house in all its Jacobean glory. The other element of the set was a group of screens made of mesh. These were used to re-shape the acting area, but also to hint at other issues. Fuchs used them to suggest confinement, restraint and being trapped. The fountain in act one was simply a circular shaped enclosure made of screens in which the ghost (made present in the form of an actor) distributed roses. 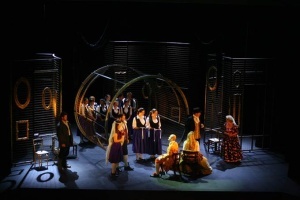 This circular shape was used to confine Lucia (Elvira Fatykhova) prior to her interview with Enrico (David Stephenson) in act 2. Later in the same interview, it is Enrico who himself seemed to be confined. During much of the wedding scene and the mad scene, the chorus were confined behind the screens looking for all the world like caged wild animals. And finally the Wolf's Crag, the retreat of Edgardo (Aldo di Toro) was itself a confining shape. Antony McDonald is designing and directing the new production of Tchaikovsky’s opera Queen of Spades which opens at Grange Park Opera on 13 June with Anne Sophie Duprels as Lisa, Carl Tanner as Hermann, Quirijn de Lang as Yeletsky and Anne-Marie Owens as the Countess, conducted by Stephen Barlow. I interviewed him in advance of the premiere. It is McDonald’s first time working on Queen of Spades though he has designed both Tchaikovsky's Eugene Onegin and Prokofiev’s The Gambler. Prokofiev’s opera has much common with Queen of Spades and McDonald feels that Tchaikovsky’s compulsive music re-occurs in the Prokofiev. For McDonald, Queen of Spades is an powerful opera, one he feels might be finer than Eugene Onegin. Tchaikovsky wrote it very quickly, McDonald describes the rich score as a masterpiece, full of driven undercurrents and with the leitmotif of fate. A lover of Russian culture, McDonald first saw Queen of Spades at Welsh National Opera in the 1970’s and loved it, finding the piece incredible. He feels that there is an element of Tchaikovsky and his brother Modest (who wrote the libretto) in each of the characters. Each character in the opera is damaged in some way, each on a destructive course. It is a tragic piece and whilst none of the characters is completely likeable, McDonald would hope that we empathise with them; that we feel for them, for the pain that they suffer. It is this which gives us a link to the piece. McDonald talks of Hermann’s outsider status as being comparable to that of Peter Grimes. Hermann is of German extraction in Russia. He has few friends and the ones that he has tease and torture him. The role of Hermann is a particularly taxing one, as the character is in every scene. But, as McDonald puts it, the Hermann goes on a hell of a journey. The difficulty is to make sure that the character does not go too crazy, too soon; to ensure that we, the audience, empathise with him. Well that serves me write for commenting on the weather at outdoor opera. Last night at Opera Holland Park the weather did its best to sympathise with the drama on-stage. No rain, but plenty of wind with lots of groaning in the rafters from the canopy. Also, by the opening of act 3 the cold meant that most of the opera goers were wrapped up, blankets in abundance, looking for all the world like refugees rather than a first-night opera audience. Still, it didn't seem to phase the singers and players, which was amazing. The programme book for last night's performance of the opening of this year's Opera Holland Park Season included details of next year's operas, quite an interesting mix. Cavalleria rusticana and Pagliacci, Madama Butterfly, Les pecheurs de perles, L'elisir d'amore and I gioielli della Madonna. Lovely to see that Wolf-Ferrari's opera is getting an outing and I will be fascinated to see it. The City of London Festival opens in a couple of week's time on 24 June, running until 27 July. An amazing explosion of events cover the City for a month starting with a Festival Service at St. Paul's Cathedral where Judith Bingham's Missa Brevis The Road to Emmaeus and The Pilgrimes Travels will be sung and the Bishop of London will preach. One of the advantages of the festival is that the square mile has an amazing profusion of superb historic venues where concerts can be put on. This year the festival is celebrating its 50th anniversary. The first festival featured the London Symphony Orchestra conducted by Colin Davis and guitarist John Williams and all will be returning for this festival. 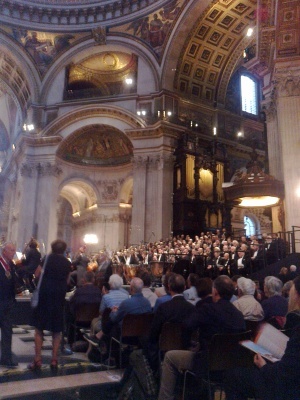 The LSO and Colin Davis are giving two performances of Berlioz's Grande Messe des Morts in St. Paul's Cathedral with Barry Banks as the tenor soloist (25 and 26 June); essential listening for all of us Berlioz lovers, especially as the Requiem is too big for Davis to include in his Barbican concert series. John Williams will be giving a recital on an Australian theme at Fishmongers Hall (10 July). In addition to Judith Bingham, there are plenty of other contemporary composers. The LSO Brass Quintet are playing a new fanfare by Francisco Coll at the Goldsmiths Hall (27 June), Tansy Davies has a new piece for the Orchestra of the Age of Enlightenment (OAE) under conductor Edward Gardner (should be an interesting combination!) at the Mansion House (28 June). Nigel Osborne has written a new piece especially for Clarence Adoo's Headspace Ensemble; Adoo is a musician who was paralysed in a road accident 15 years ago and uses a specially designed Headspace instrument. (6 and 7 July). Also on 6 July in the great hall of the Guildhall, the Swedish Wind Ensemble will be directed by trombonist Christian Lindberg and will be playing a piece of Lindberg's own. Other personal highlights include the OAE again, under Nicholas Cleobury, at St Bride's Church (4 July), playing Judith Bingham's Jacob's Ladder and the premiere of The Hythe plus a Handel organ concerto and the Pergolesi Stabat Mater. A delightfully named Dutch vocal group, Wishful Singing in a programme of Lassus and Morley to Paul Patterson. Lunchtime recitals, often free, include many from Guildhall School musicians, including an all Walton programme including the piano quartet and Songs from the Lord Mayor's Table (13 July). Also in 13 July, the Aurora Orchestra and Nicholas Collon are performing Biber, Holst, Shostakovich and Julian Phillips in what seems to be a war themed concert. You'll need to visit their website to find out more. Ned Rorem's opera, Our Town, was premiered in 2006 when the composer was 83. It was commissioned by Indiana University and so it seems appropriate that the work's European premiere took place at the Guildhall School of Music and Drama. We caught the final performance on 6 June. Rorem is best known for his songs, though his output includes operas, symphonies, piano concertos, choral and chamber music. He is also the author of a highly regarded series of diaries. Our Town is based in the play by Thornton Wilder which was written in 1938. Rorem collaborated with the poet J. D. McClatchy on transforming the play into an opera. Wilder's play was intended as a counter to the excessive realism of contemporary American theatre. Wilder intended the play to be played on a bare stage with the actors miming all action with no props. There is a stage manager who controls things and who sets each scene. The play opens with the stage manager firmly in the present, before the setting is moved to the small New Hampshire village of Grovers Corner in 1901. Rorem and McClatchy kept this basic structure in the opera, remaining true to Wilder's play. The language of the play is simple and direct, so it lends itself to operatic setting. Director Stephen Medcalf and designer (set and lighting) Simon Corder also preserved Wilder's intentions. They set the action on a plain platform with just a row of seats (like church pews) at the back. The auditorium of Guildhall's Silk Street Theatre was re-configured to give a playing area surrounded by the audience on three sides, with the orchestra in a pit in front of the playing area. Costumes (by Susannah Henry) were also in period. For years after it was founded, Glyndebourne Opera House was sui generis, an opera house based at an English Country House. Though the opera originally took place in a small, but full functional theatre, the other logistics of opera-going ( getting from your car, bars, restaurant, picnics) place some reliance on the uncertainty of the English weather. I have strong memories of both the old and new opera houses at Glyndebourne where the coldness of the weather on the Downs meant the bar areas were cold and picnicking was a bit of a challenge. And one memorable occasion when the weather was so bad that picnickers had to be fitted into every available dry nook and cranny. But, all in all, Glyndebourne has been relatively immune to the weather. 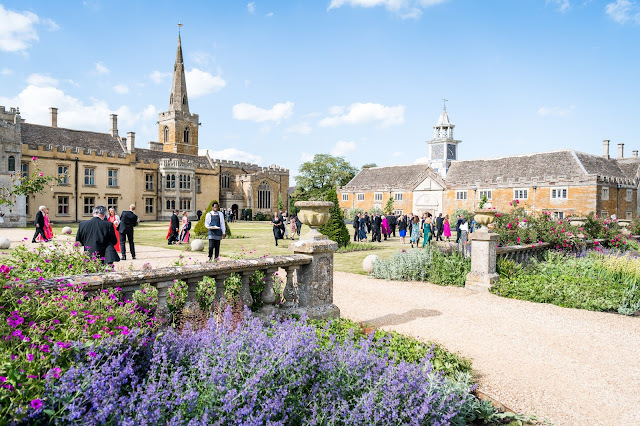 However the rise of English country house opera in the last 20 years or so seems to have taken place in spite of the vagaries of the English climate. Few places are lucky enough to possess a fully functional indoor theatre and planning restrictions mean that you just can't go out and build one. Smaller companies rely entirely on being out-doors and hoping for the best. Larger ones with permanent bases have developed a variety of coping mechanisms, trying to compromise between the ideal and the reality. Grange Park Opera takes place in a custom built theatre within the old Orangery of Northington Grange House (a semi-ruinous neo-classical mansion in Hampshire). Though in the early days the facilities were quite challenging for the performers with the backstage and wings being effectively out of doors (just the stage and audience were in the warm and dry). This has been transformed with the building of the new theatre. But like most country house opera, the total experience is reliant on the weather with picnics, semi-out door bar facilities and car parking in neighbouring fields. Longborough Opera also has indoor facilities, based on what was a barn. Here they have ambitions to stage a full Ring Cycle, so it would certainly be tempting fate to attempt to do so in the open air. Opera Holland Park use a custom built pavilion which keeps off the rain but cannot do much in the face of strong winds. Having started out as open air, Garsington Opera are now in their new home which is also a custom built pavilion. But this is a temporary structure, a pavilion rather than an opera house. And judging by Rupert Christiansen's recent review in The Telegraph, the venue is still rather dependent on good weather. But here we come up against planning. When Grange Park Opera were starting to perform at Nevill Holt in Leicestershire, it was not possible to get permission to create a permanent theatre within the historic stables. Similarly, it even if they wished to, you suspect that neither Opera Holland Park nor Garsington Opera would find it easy to get permission to built a permanent theatre from scratch in their present locations. Longborough were luck enough to possess a building which had the capability of being transformed, no matter how unlikely it might have seemed at first. There is a dichotomy here, one which is touched on tangentially in Rupert Christiansen's review. Whilst country house opera is a bit of fun in a temporary theatre where the weather is simply one of the extra bits of entertainment then generally we are OK (after all English audiences still seem to get a bit of a kick from cheating the weather). But as performances increase in quality, and rare repertoire is performed, then critical notice is expected to be taken. And just how do you review a performance which is suffering from the weather. I have read reviews in the past where, reading between the lines, you can tell that critic and audience had a rather poor time of it and that you felt sorry for the poor struggling singers. A couple of years ago we went to a country opera festival in Bavaria (Gut Immling), situated in a custom built barn on a farm. Yes, it was to a certain extent predicated on the weather; you could tell that if the weather was kind the experience would be glorious. But the night we went, the heavens opened. The result was nothing like an English country house opera. We were ferried to the opera house by bus from the local town, the theatre was large, weather tight and capacious, and there was a huge circus tent in which the entire audience could sit down for a meal in something like comfort. We barely noticed the rain. You see, country house opera in England from Glyndebourne down is founded on optimism. It relies on the expectation that the weather will be lovely and that the experience glorious, opera in a country setting with a picnic by the lake/herbaceous border and a view of the countryside preferably with cows. When it works, it is magical, especially when the opera performance is something special as well. But pity the poor performers and the audience when the wind blows, rain comes down, temperatures plummet and everything is cold or damp. My review of Handel and the Rival Queens, the final concert in this year's Lufthansa Festival of Baroque Music is on the OperaToday website. My review of Chelsea Opera Group's performance of Donizetti's Maria Padilla, with Nelly Miricioiu in the title role, conducted by Brad Cohen is on OperaToday.com. A few years ago I attended a group of performances of contemporary opera, where over two days I saw six short pieces, some fully staged and others just work in progress. My companion at the performances was a director and librettist with whom I was planning new opera. After the operas, though we had seen much interesting, innovative and lively work, we felt that little of it was opera as we defined it. Instead we saw a variety of dramatised monologues, music theatre pieces and plays with music (dialogue pieces where the musical accompaniment is of more interest than the vocal lines). My composing background is vocal and choral music though I have worked in cabaret, written musicals and staged two operas. But as a writer and listener, I am intensely interested in opera, its production, historical development and how the genre is developing in the contemporary world. The problem with being both a critic and a composer is that when you have a critical view of a performed work, it is difficult for this not to spill over and for the composer to wonder whether they could do better. Or conversely, when the critic admires a new work, then it can be difficult for the composer not to feel a little jealous. This is a faulty position to take as each composer is different and the process of creating an opera doesn’t occur in vacuo, it arises as complex sequence of events which involve a number of different participants. Very rarely does a composer simply sit down to create an opera and write exactly what sits in his head. In the past, opera composers were often part of a system. Opera companies routinely produced new work and young composers had access to professional librettists and a variety of potential outlets for their work. The big effect of this was that the composer could learn from failure and go on. This ability to fail has, largely, been lost. New operas are now rather more major events, much more hangs off them, putting great pressure on composers to get things right first time. The opera commissioning and producing process is complex and difficult to stop. So there is real danger of work reaching the stage which ought to have been radically altered at birth. I’m sure that we have all attended new operas where we have felt that the work ought to have been performed in a radically different form, the feeling that within an uninspiring longer work, lies a fine short one. In order to help combat this, the workshop system has developed, so new operas are tried out before full production. 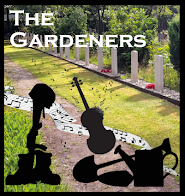 Whilst this is laudable in theory, I have attended some contemporary pieces which seem to have been workshopped to death; the workshop process having gone from enabling a composer to hear their work, to stifling the innovative and dramatic instincts. Another problem for the contemporary composer is the lack of experience professional librettists. With the drop in the number of new operas being produced at major houses, there are few people who specialise in writing opera libretti and have the experience to construct a good libretto. In a programme note for George Benjamin’s Into the Little Hill, his librettist Martin Crimp stated that a successful libretto should feel incomplete, something lacking; the missing element being, of course, the music. Too often modern librettos are all too self sufficient. Post-war opera has been heavily play based, with stage drama being a strong influence on the operatic form. But few composers and librettists are entirely talented at turning a play into a good libretto . Britten and Pears re-construction of Shakespeare’s Midsummer Nights Dream is a paragon in this respect. But what often comes out nowadays is what I call the play with music. Vocal lines are cast as continuous arioso and the orchestra comments on and colours the line. Interest is too often in the orchestra and vocal lines seem to chug along, rather than developing memorable dramatics. This isn’t just a case of tonality versus modernity. Composers of both casts have been responsible for producing uninteresting works. In recent years James MacMillan, Thomas Ades and George Benjamin have shown that dramatic operatic work is possible, without talking down to the audience. And Michael Berkely’s operas written with David Malouf have been notable for the deft way Malouf’s librettos leave plenty of room for the music. What we have lost is the feeling for opera as a distinctive, known form. In the past young composers worked in an environment where it was clear what opera was. This gave them something to match themselves against; and, if they were iconoclasts, something to struggle against. But in the current environment, composers have to invent the form for themselves. To go back to the operas I mentioned at the beginning, there were examples of composer/librettist pairings attempting to re-invent the form for themselves. But lacking historical insight and perspective, they simply came up with something jejeune. But composers should be allowed to fail and I hope that the composers in question were encouraged to try again, but better. Two composers whose career path has approached those of opera composers in the past are the late Stephen Oliver and Jonathan Dove. Both of whom have produced a large body of variety work, developing their craft over a period of time. Dove’s opera Flight is successful partly because the form used is historically informed, aware of what operatic form has been in the past. And Dove's career as an opera composer started with his orchestral reductions for City of Birmingham Opera, notably reducing The Ring, down to evenings. A rather modern take on the way composers of the past worked their way up the food chain. These thoughts have been very much in my mind because I spent a lot of 2010 year writing my new opera When a man knows and then staging it in 2011. Here the critic has to defer to the composer, and is affected by the complexities of the development of opera. Whilst I know that working with an experienced librettist is an ideal, exigencies have meant that I have set my own libretto based on an existing play. And in June 2010 we gave a concert performance of the opera as a form of workshop to try out the work before a full production. Following on from that I worked with both the conductor, David Roblou, and the director, Ian Caddy, to tighten up the piece before the full staging. We had the advantage that Ian Caddy was able to hear our repeat concert performance of the work in August 2010 and use this to inform his views as to what did, and didn’t work. The resulting changes were not radical, but helped to tighten the drama. So the critic as composer can find himself breaking his own rules. The most that the composer can hope for is that the new work will have a dramatic life of its own, that it will move audiences to laugh and cry in the right places. John Eliot Gardiner, the Orchestre Revolitionnaire et Romantique and the Monteverdi Choir are taking Beethoven's Missa Solemnis on tour (with the ninth symphony). We'll be able to hear it in London at the Barbican Centre on 17 October, but the tour starts on 28 September in Pisa and takes in 10 European venues and three American ones with a final Beethoven Nine in California on 20 November. Quite a trip. The Brighton Early Music Festival (BREMF) had a launch event on Thursday, in the studio of harpsichord maker Malcolm Rose. We were treated to music from some of the festival's young artists and the joint artistic directors, Clare Norburn and Deborah Roberts, described some of the delights to come at this year's festival, which runs from 26 October to 11 November. For some years now, the festival has run Early Music Live! where they select young ensembles and provide them with a platform at the festival and beyond. Since 2007 they have supported over 100 indivituals. This support extends to BBC broadcasts, introductions to promoters and is intended to act as a bridge between college and real life. This year the panel, which consisted of Deborah Roberts, Clare Norburn and Alison Bury, auditioned 20 groups. One selected was the flute/guitar duo Duo Flauguissimo (Yu-Wei Hu and Johan Lofving). They entertained us on Thursday with music by Schubert and Mauro Guiliani. The latter being a guitar virtuoso in early 19th century Vienna who wrote a body of attractive music for flute and guitar, and being a virtuoso himself the guitar parts tended to be interesting. Claire Williams was part of BREMF's Early Music Live! scheme in 2008 and has since participated in every festival. Her contribution on Thursday, played on a lusciously toned Malcolm Rose copy of a 17th century French harpsichord, consisted of Purcell's Suite No. 7 in D minor, Froberger's Tombeau sur la mort de M. Bancrocher and Handel's The Harmonious Blacksmith. The festival is perhaps unusual in being run by musicians and they take a very creative view of programming. Though the festival will be featuring well known groups such as the Sixteen and the Tallis Scholars, there are also events of their own devising. The theme of this year's festival, in fact the 10th festival, is Celebration. The life and work of the influential Early Music pioneer David Munrow will be celebrated in an event (on 10 November) which will include a talk with members of his original group and performances by the BREMF Renaissance Band - what, Deborah Roberts described as a tribute band, brought together specially for the performances. Since Munrow's time, many Early Music performers have moved closer to the mainstream repertoire and perhaps this celebration of what would have been Munrow's 70th birthday will encourage a revival of his style of music making in this colourful period. I never saw Munrow perform live, but have strong memories of listening to his radio programme when a student. The festival's major theatrical event is a performance of the 1589 Florentine Intermedi. These were originally mounted as interludes between the acts of a play, La Pelegrina, put on to celebrate a Medici wedding. The musicians and designers involved were some of the leading ones in Italy and the Intermedi are an important staging point on the way to opera. Involved were such composers as Marenzio and Peri; Peri was the composers of Euridice, the first opera, and he was also a virtuoso singer and wrote a spectacular aria for himself to sing in the Intermedi. To help recreate some of the spectacular effects of the original stagings, without the benefit of a Renaissance Prince's budget, BREMF are collaborating with Zu Aerial Dance, utilising circus performance, aerial dance and cutting edge technology. A substantial renaissance orchestra will include performers from the Monteverdi String Band, the English Cornett and Sackbutt Ensemble and other players. The soloists will be led by tenor Mark Tucker, with the BREMF Consort of Voices and the Renaissance Singers. It promises to be a spectacular and memorable event, both musically and theatrically. Put 3 November in your diaries now. Other performances in the festival include a celebration of Gabrieli, music from Musica Secreate, the Orlando Consort and the Tallis Scholars. An interesting programme is planned for the 2013 Grange Park Opera Festival. Claire Rutter (this year's Madama Butterfly) is returning to sing Elvira in I Puritani in a production directed by Stephen Langridge, conducted by Gianluca Marciano. Then Stephen Medcalf's production of Eugene Onegin (at Nevill Holt this year) makes is appearance at the Grange. The third opera of the season is Poulenc's Dialogues des Carmelites, conducted by Stephen Barlow and directed by John Doyle with Anne-Sophie Duprels as Blanche, Sara Fulgoni as Mere Marie and Anne-Marie Owens as the Old Prioress - I can't wait! Next year will mark as change of format as the Grange Park Opera Rising Star will no longer be performing at Nevill Holt. Instead they will perform Messager's Fortunio at Grange Park Opera and then take the production to the Buxton Festival and London's Cadogan Hall. Fortunio was one of the last operas we saw at Grange Park before they re-built the theatre, its a charming piece and I look forward to seeing it again. The Northern Sinfonia (who are based at the Sage, in Gateshead) will be making a return to London's South Bank Centre in February 2013 for The Rest is Noise Festival; the orchestra will be playing a programme of 20th century classical music influenced by folk music with music by Komitas, Ives and Grainger. They are also commissioning a new piece from Benedict Mason to be premiered as part of their 2012/13 season at the Sage. This is a concerto for sackbut (! ), which will be performed by Mike Svoboda the trombonist and composer. They are also working with advanced composition students from Newcastle University. The main season includes all of the Brahms and Schumann symphonies paired together, conducted by Thomas Zehetmair. Plus their Late Mix series which encourages the audience to explore new areas, via eclectic programmes with supplementary lectures and events around the concerts, the series looks at works in their wider cultural context, from Venice in the 1500s and Austria in the 1700s, to the sounds of post-WW1 Paris and those of contemporary North America.